The head of the house hold normally sits at the head of a rectangle dining table, and King Arthur used round to signify equality. I am not sure what seating arrangement protocol is at an oval conference table is, but that is Urz Pilz sitting at what would be the head of the household position at a rectangle shaped table. 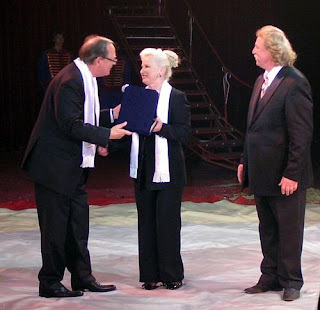 International participants met at a meeting of the ECA on 11 October 2008 in Warsaw in cooperation with the 10th Circus Festival organized by the CYRK Zalewski. The host of this meeting was Zwiazek Pracodawców of Cyrku i Rozrywka (ZPR), the Polish circus. The magnificent Prymasowski Palac, a former Episcopal palace, we saw the circus managers of Poland, Norway, Spain, the Netherlands, Germany, France, Denmark, Hungary and Russia. Special guests were Jerzy Wenderlich, vice-chairman of the Culture and Media of the Polish parliament, and Zbigniew Krzywicki, a Polish veterinarian specializing in circuses. Stanislaw Zalewski, president of ZPR, welcomed the participants. The circus animals were the central theme. The regulations for animals are very strict in Poland, so it is specifically stipulated for each species that animals can learn. It is not clear if the Polish authorities apply regulations for transporting animals in the EU also circuses. The ECA said that circuses are excluded from the directive. The passport of the EU animal has been introduced in Poland. In addition, there was talk of the organization of the European Day of Cirque. In 2009, Polish circus will also participate. Members of other countries have once again emphasized that the pressure by activists on animal circuses continues to increase. Thus, Urs Pilz told that PETA has recently begun a campaign complete with pamphlets, DVDs and letters to German personalities. To defend against such activities, it is important that ACE become increasingly known among politicians and the media as representative of the European circus. ("SOMEBODY COUNT FOR ME HOW MANY TIMES AMERICAN CIRCUS IS MENTIONED IN THIS ARTICLE, IN CASE I HAVE MISSED ANY.") Zalewski has invited all circuses to contribute by printing the logo of the ECA on their posters and their programs. The European Circus Association represents circuses European vis-à-vis the authorities and in public. She wants to promote art and culture of circus and protect this important part of our cultural heritage. Urs Pilz, the president of the ECA, is vice president and artistic director of Festival International du Cirque de Monte-Carlo. "Maybe I am not seeing the "big picture" and I don't think I am out of place in asking for some type of explanation for my understanding. OF WHAT BENEFIT IS ECA TO THE AMERICAN CIRCUS, AND AMERICAN CIRCUS ANIMALS IN GENERAL??? ECA is the organization fronted by Monaco and Princess Stephani that OABA(Outdoor Amusement Bursiness Association) and their branch organization CIRCUS ANIMAL FUND donated funds to and became a member of in Monaco last winter. According to officers of the OABA CIRCUS FUND that I have spoken with, they are having a real tough time getting donations and funds from the Circus industry. Do you suppose???? As a rule, you like to know where the funds are going and where they will be used, and of what benefit they will serve you as an individual in an organization. Yet when I approached the Monaco/ECA issue they did not know why OABA/Wayne McCary flew to Monaco and donated funds. So I will ask again, and hopefully there is a reasonable explanation, and we can get the newest fund raiser kicked into high gear. I have not mentioned names of the officers who were going to check it out for me and get back to me out of respect. and they know who they are. But I, and the rest of the circus industry are still still waiting for a reasonable answer/explanation. HELP IN THE EFFORTS TO KEEP ANIMALS, primarily exotics, providing their unique entertainment and presence in circuses, fairs, zoos and many other traditional venues for this type of extraordinary entertainment. The Outdoor Amusement Business Association has established the OABA Circus Fund which raises funds so they are able to hire professionals to assist with challenges such as legislation that threatens our members' businesses. These funds also help combat the misinformation, prejudices and enormous money, which the opposition can and does provide. The OABA's goal of $40,000, when compared to single donations of seven figures, sounds pretty paltry. Actually it is! The funds raised are spent with great care. As odd as it may seem, the effort does make a difference and is one of very few dedicated to keeping circus animals in business. What we are addressing here is the statement "funds raised are spent with great care."